It’s a bright spring day, with few clouds in the sky and the sun beaming down. On a day like today there’s no better place to get a great view of Portsmouth than Portsdown Hill. With that in mind, I decide to grab lunch at The Churchillian. Set upon the hilltop next to the main viewpoint, the pub is a popular favourite with locals, tourists, and hill walkers. As I park up and glance out over our beautiful city, I pass and say hello to a couple who have stepped out in their walking gear, suggesting they're heading for a nice, long stroll beforehand. And as I walk in, there is a distinct mix of people – hikers, some groups catching up over their meal , and some simply enjoying the great views. The place has a distinct modern pub feel, but at the same time almost acts as a viewing point in itself. I take a seat in the dining area and after taking a couple of minutes to scan the menu I settle on the only meal I feel can satisfy my hunger – the 28-day- aged, 10oz Blackgate sirloin steak. Priced at £16.45, the char-grilled steak comes with chunky chips, beer-battered onion rings, grilled tomato and a garlic and rocket butter. But before the main attraction, I order a Pep si and garlic ciabatta bread (£3.25) as a starter, and it arrives at my table less than five minutes after I leave the bar. In terms of quantity you definitely get your money’s worth with four large pieces to tuck into. The garlic definitely has a strong flavour to it, although it would have been better if it was spread more evenly throughout the bread. While I wait for my main meal to arrive I wander over to the window for a good look at the views outside. In terms of scenery, it is difficult to imagine there's a better place for a spot of lunch. 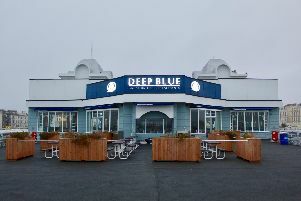 The restaurant is well-positioned on the hill so you can get a clear view of Portsmouth to the left and Gosport to the right, and can see as far down the coast as the power station at Fawley. My steak lunch arrives, and at first glance it looks well-presented and more than likely to fill me up – although I am slightly disappointed at there being only three relatively small beer-battered onion rings. There was some seasoning to it, but it really needs the butter to give it the taste it deserves. The problem is, although the butter has a lot of flavour in it – the garlic taste is particularly strong – it also tastes extremely fatty so might not be to everyone’s taste. The chips and onion rings are a nice addition to the plate, and the chips in particular are piping hot. Although they are well-cooked, both lack flavour and the meal is reliant on the sauce for that purpose. If nothing else, it is certainly filling and leaves me satisfied enough to go without dessert, despite the appealing options on the menu. It is important to highlight the major positives of The Churchillian. As well as the aforementioned breathtaking views, the service is very good and the pub boasts a large amount of space – a large group is having a meeting in one half of the room. The food isn't too pricey either. You can expect to pay between £10 and £13 for a main course, with an extra £8 to £10 if you are going for all three courses. From my experience though, the menu offers a tempting selection but the food does not quite have the flavours to live up to expectations. Now, where is my walking gear? I've got an exciting walk ahead!